Nestled in the warm Equatorial South Pacific waters off the coast of New Guinea is the group of islands known as the Solomons. This chain of islands has long been known for their fierce headhunting tribes, which has led to the islands remaining isolated until only recently. These islands offer unspoiled diving adventures, with many areas virtually untouched. 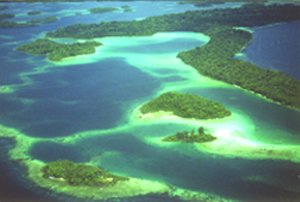 The Solomon Islands have remained relatively unexplored except during the Second World War, when their strategic position was valued by all sides. Like most of the islands of the South Pacific, their islands are strewn with the relics of the machines of war. Airstrips dot each island, vessels and other war debris litter the waters. But this 'war junk' now makes possible many adventures for the diver and underwater photographer. Most of the accessible wrecks have become underwater sanctuaries, encrusted with colorful growths, and home to a wide diversity of marine life. 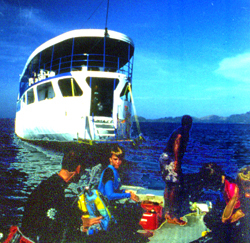 There are six dive operations throughout the Solomons. Dive Solomon has three locations, two in Honiara and one at the Gizo Hotel in the Western Province. Adventure Sports also in the town of Gizo has been operated over the last six years by Danny and Karrie Kennedy. Island Dive Services at the Mendana Hotel in Honiara has the most complete dive shop in the entire Solomon Islands. Diving is also available at two other locations in the Western Province on the islands of Munda with Solomon Sea at Agnes Lodge, and at the Uepi Resort. The most well-known operation is Bilikiki Cruises which provides excursions on a luxury live-aboard -with door-to-door service from the Mendana Hotel in Honiara. With only three weeks to explore we decided to dive with the crew of the Bilikiki and in the Western Province. Over the last ten years, I have traveled the world in search of the most exciting and unique diving. Reports from other divers who ventured into this primitive part of the world brought back fabulous stories of the diving from the decks of the Bilikiki. Trying to surpass the superb diving of Truk and Palau just north of the equator, I was excited to taste the best of the South Pacific diving. 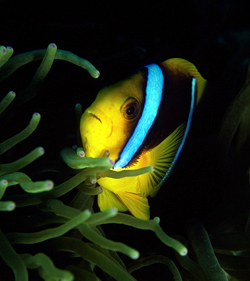 As a travel and underwater photographer, it is sometimes difficult to find experienced photographic subjects. On this trip I was lucky enough to have a diving companion with international modeling experience. With cameras in hand, we began our search for huge soft corals, giant fans and big fish. This 26-passenger air-conditioned luxury vessel has a crew of eleven and will sail with as little as ten guests. Our trip had only 12 guests to enjoy the personal attention of the dive staff and the spacious rooms with their private baths. 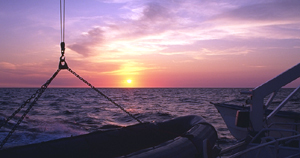 Sailing with a light guest list inspired the staff to explore uncharted dive locations. No one could tell how the diving would be since most of the dive sites in the Florida Island Group are unexplored. After getting permission from the natives to dive off an untouched island, we descended to find sheer walls adored with enormous gorgonian fans. Nudibrancs, clownfish, lionfish, Maori wrasse and surgeonfish all awaited our discovery. Each dive into uncharted waters held unknowns that promised to surprise and thrill each and every one of us. At the end of a full day of diving, gazing to the brilliant sunsets off the stern of the Spirit warmed our souls and helped to erase the pressures of modern life. Now that the Solomon Islands have established a reputation for its fabulous unspoiled diving, land-based diving is beginning to be offered. The many airstrips left by the war has led to the connection of most of the small islands, especially in the Western Province. One of Solomon Airline's inter-island Twin Otter aircraft lifts us off to hop across several palm-carpeted islands en route to Gizo. The last of these hops is Gizo's principal 'airport'-- the entire island is barely big enough for this sea level grass-strip runway! We settled down, on what the locals call `the aircraft carrier` and the plane came to rest within inches of the end of the runway (and the island's edge). Danny and Kerrie Kennedy of Adventure Sports were there to greet us and take us by boat to the mainland. The Marovo Lagoon, the largest salt water lagoon in the world (called by many the 'Eighth Wonder of the World'), runs for thirty miles and is protected from the New Georgia Sound by a series of fringing islands with few passages between. The resort is located on one of these passages--providing excellent access to the diving of New Georgia Sound. After being shown to our private bungalow at the end of a long and flower-laden path, we settled in to await new adventures. Exploring the waters around Gizo includes visits to many of the war relics, such as the shot down Hellcat and Corsair American fighter planes, a Japanese Zero and several sunken freighters, the largest of which is the Toa Maru. This 450 foot Japanese transport ship contains many fascinating World War II artifacts which Danny has tucked away in secret crevices. His is the oldest dive operation of the area and offers many steep drop-offs, and exciting pinnacles as well as discoveries of hidden treasures from long lost ships. Our next stop is Munda-David and Mariana of Solomon Sea Divers offer a very personal and unique type of diving. although there are many 'wall' dives to be found in the Solomons, the dives along Coral Corner are some of the most radical. These rival the best walls of the Caribbean and even Palau. Many are 2,000 foot drops with severe undercuts. Surrounded by an incredible diversity of glimmering fish, we swam past large fans and soft corals that adorn the majestic walls. 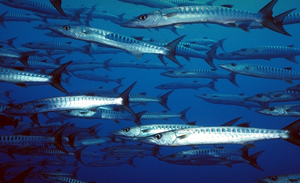 On one of these dives along the Rainbow Passage off Tomba Tuni--'the Mushroom Island'-- we were treated to a large school of Barracuda. although diver attacks by schooling Barracuda are unheard of, my buddy was still reluctant to swim within their swirling masses. We were totally unprepared for the extreme beauty awaiting us at Uepi Island Resort and that this island was going to fulfill our vision of a South Pacific Paradise. At the lower end of New Georgia is yet another grass airstrip (this one a bit bigger) at Seghe. We were greeted by our boatman, who told us that the island resort was only 30 minutes up the Marovo Lagoon. 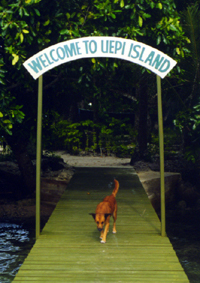 After 45 minutes of a fast, wet and bumpy ride we arrived at Uepi Island Resort. As we were to find out later, when you are on island time, everywhere is `only 30 minutes` by boat. As we arrived, Suzanne was waiting on the dock and a great friendship began immediately. We dove the untouched New Florida waters in the south with the crew of the Spirit, off the coast of Honiara, Gizo island, Munda and in the New Georgia Sound off the tiny western island of Uepi, one of the top ten dive locations in the world. But more than fantastic diving and clear warm waters teeming with a diversity of sea life, the Solomons offer a unique experience of islands, turquoise sea and friendly people. 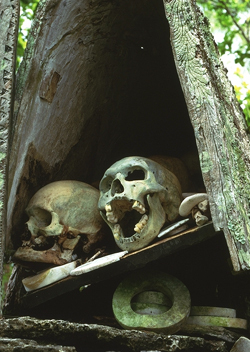 Don't miss a trip to 'Skull Island' to see the ancestral bones that protect the islanders--permission is granted by the Chief-but don`t touch or you may be swimming back--or worse. Our tour of the diverse Solomon Islands was just about over and we wanted to bring home a few more tangible memories of our adventures, the islands and its people. 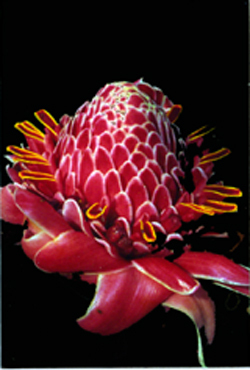 The islands, well known for their wood carvings, have experienced a wide following with many carvers distributing their unique artifacts to South Pacific areas in Fiji, Vanuatu and New Zealand. On this last day, we set off to Telina Village, home the best carvers in the Solomon Islands and more than 30 minutes (really an hour) by fast boat from Uepi Island. This village of about one hundred people receives few visitors except on shopping days. 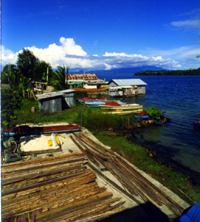 Telina Village is nestled on a quiet lagoon, filled with the sounds and smells of the islands and its people. We walked along from house to house admiring their art and meeting the warm and friendly people. Their houses and yards were kept neat and clean with pretty flower gardens everywhere. Naked children played and washed in a small public water faucet. Known for their outstanding wood carving skills, and unique works of art, the craftsmen here offer good prices for those that make the long journey to shop direct. There are three prices you can get if you're willing to bargain. Solomon islanders do not like to 'haggle,' but depending on your shopping skills and your friendliness, they will offer you one of these three prices. Feel happy if you get a `good price` and honored if you get an `excellent price.` Both these should be viewed with relish, but to receive a 'very special price' is the best deal of all and truly an honor. The many excellent wood carvers of Telina Village offered us items unlike any in the world, including a tiny magical turtle crafted from the rare and valued ebony wood that we got at a 'very special price.' With shopping complete, we began our trip home from market. The very long, bumpy and wet boat ride across a choppy sea to Telina Village was now replaced by the smooth waters of our return. Clutching the rewards of our adventure, we glided passed the lagoons, islands and villages as the sun began its daily process of sinking into the sea. The sky was filled with the colors of dusk. With the roar of the outboard motor and the splashing of boat and sea--we drifted into a trance created by the magic of the warm Solomon Sea. 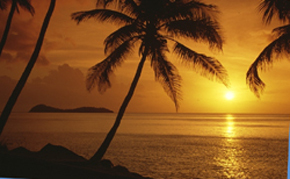 As the sun set, we drifted off in the beauty of this island paradise, swayed by the breeze as we lounged in our hammock between stately palm trees. We had to pinch ourselves to see if all this was real. Soon our hunger got the best of us, and we joined the other guests for an incredible spread of lobster, coconut crab and other island delicacies--the best food, I might add, of all our Solomon travels. Story and photography by Robert Aston. All rights reserved.